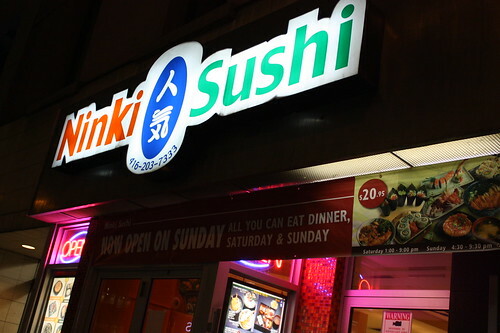 Ninki Sushi is located in the Financial District on Adelaide Street West. There is a second location nearby that has more formal type seating and is located inside the Scotia Plaza (40 King Street West) on the Concourse level. 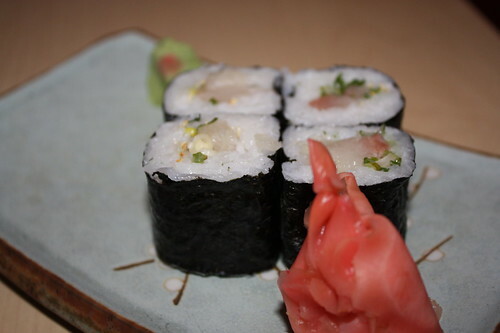 Please read our conversational review of Ninki Sushi on Adelaide, below. ‘Plan A’ was to hit up Ninki in Scotia Plaza but my fellow reviewer decided to sit himself down at the Adelaide location. No worries, though, as my guess is this one is more for those wanting a casual sushi experience anyway. I could be wrong. Also, this one is open on weekends, I believe, where the Scotia Plaza location is not. Yeah that was a bit of a SNAFU on my part. I came out of the subway and started walking towards the Adelaide and happen to see the “Ninki” sign and assumed that was it. Once I was seated, I look around the restaurant and notice a poster saying “try our other place in Scotia Plaza” and realize that I am in the wrong restaurant! Anyways, this place has a more casual feel to it with a lot of bright colours that seems geared to towards the non formal dining. I made my way from Scotia Plaza to Ninki on Alelaide. It’s actually pretty much across the street from the Adelaide entrance, so not much of a walk required. The banner out front screams that they are now open on Sundays – and that Saturday and Sunday dinner is all you can eat. We were there on a Tuesday, however, so it was a la carte for us. Our waitress was quick to offer us something to drink. I went with a ‘large’ Asahi, although it seemed like a regular sized bottle to me. They had a pretty large menu with the usual variety of rolls that you see in Toronto. There weren’t any signature Ninki rolls or dishes that we could have tried. This time we decided to mix it up a little bit and order some rolls as well as some sushi. Of course the obvious spicy tuna rolls and sushi pizza as our standard picks. 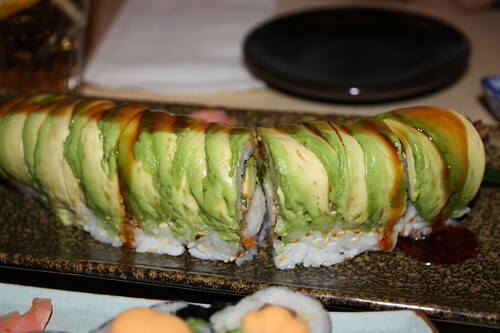 In addition to the sushi/maki tray, spicy tuna rolls and sushi pizza we also chose the Green Dragon Roll as our ‘specialty’ roll. Everything arrived at our table crazy fast, forcing some ‘heat lamp’ jokes by the Sushi Toronto review team. Guess we shouldn’t complain about fast service! Your telling me! 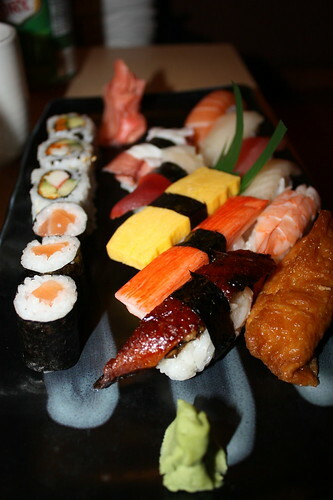 The whole point of sushi is that it is prepared fresh with care and skill by a sushi chef. I think for quality sushi, it should take a bit of time to prepare. In this case, it felt just a little too fast and the place wasn’t empty either! As always, it comes down to the taste but I was already feeling a little bit nervous. Turns out you had ever right to be. I’ll start with the sushi pizza. Actually, the sushi pizza I enjoyed, although I noticed it was covered in their special sauce that seemed to be used on other menu items as well. The sushi tray was far from fresh and the Green Dragon roll was nothing special. I think my biggest disappointment was the spicy tuna roll. The sauce on top looked pretty much like cheese whiz and the fish to rice ratio was way out of whack (as in too much rice). Agreed. Unfortunately, there was a lack of any special about the rolls. 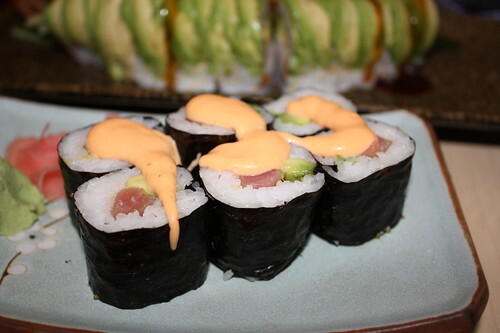 Seems that it’s easier just to slather their spicy sauce on them rather than actually prepare the sushi as it should be mixed with any sauce beforehand then rolled. The worst for me was the Unagi. It looked like it was just microwaved for the 10th time and tasted that way. Almost tasted like it was a sardine. Wow… nice. We were still a bit hungry so risked one more roll: The Hamachi roll (which is super good at Ichiriki on Bloor East). At Ninki Sushi? Not so much. Was there even any fish in it? I tasted and saw only rice. Yup the standard trick of putting in more rice to make the sushi look bigger and make it more filling. That’s basically the trick that all the prepackaged sushi places do. You know the ones at food courts or mall kiosks where the sushi combos are made before hand and you pick what you want from the cooler. Always avoid these places because you basically pay for a small sliver of fish on top a large portion of rice. Unless of course you simply love rice! Hehe… Next time you go to Ninki, order the rice! 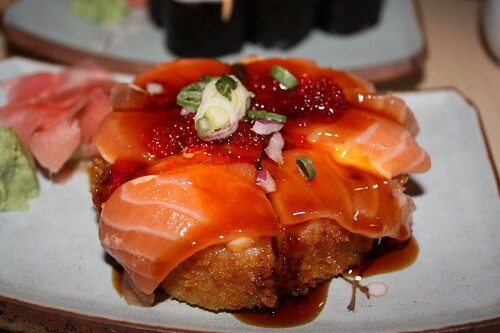 So, what was good at Ninki Sushi? The service was prompt; the restaurant setting was alright; the sushi pizza was decent… What wasn’t: Pretty much everything we ate, minus the sushi pizza. Let’s just say it wasn’t the first sushi experience of 2010 I was looking for. Quite the opposite. Not impressed. Sorry Ninki, but you get 3/10 from me. Yup it seems it’s a bad start for the new year and it looks like the restaurant mix up came back to haunt us. I would imagine that the other location in Scotia Plaza must be better. I have to agree with you on this one: 3/10 from me as well. As a consolation prize, we can only go up from here right? Terrible service here lately. The servers rush you out and the hosts are always so ignorant. I’d rather eat sushi from a food court than put up with them.